Being the undetermined, seasonal service it tends to be, the pricing for removing snow can be figured several ways. For residential homeowners, the cost of a basic, 18" poly blade snow shovel starts at $10 to $12 for inexpensive models. Prices increase with quality of materials. A shovel with a cushioned 'D' handle, and higher grade, non-slip handle and aluminum shaft will fetch $35 to $40. While lightweight snowblowers start at $200 for a 2 cycle model, $400 to $500 for a mid size unit and these go to $900 and more. Some models surpassing $1,200 to $1,500 for heavier use. For those with riding mowers as an option; an attachable blade is likely in the $200 to $250 range, tire chains close to $50, a set of wheel weights approxiamtely $100 at 30 lbs ea. and $120 to $140 for 50 lbs - depending on model of garden tractor. Many homeowners have a neighbor or similar perform this, paying $20 or $35 for a suburban drive with little slope. A common oversight here though is a lack of insurance in the event of injury or property damage. The route of hiring out the removal to a professional snow removal company, might result in structuring costs differently. Outlining specifics such as the depth of snow being cleared (akin to 1" to 3", 4" to 7", or 8" and greater depths - or simply 2" to 6" and more) for which snow removers charge incremental rates. They might charge $35 to $45 for each occurance for the same typical drive having shallower snow, but for accumulations look to spend $50 to $60. An inexpensive per-hour rate is about $20 to $35 and more when using equipment. As an extra, some companies do offer de-icing services depending on your drive, such as the possible spreading of; calcium chloride, magnesium ice melt, sand or salt. These applications should be evaluated per the surfaces. Companies are also apt to use a truck-mounted plow or a heavier blower to accomplish things. For smaller parking lots, $50 and greater is often paid and this with little or at least minimal hand-shoveling, such as for walkways and steps. 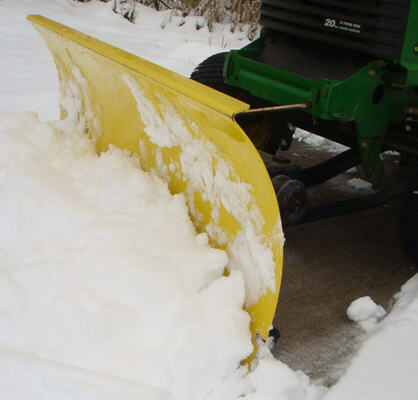 For those with larger scale needs, some company snow removers offer services for bigger lots, where the situation calls for snow boxes and clearing by tall plows on heavy trucks. In this case, they may want a monthly committment contract (whether or not it is plowed, basing some part at least on availability) while spelling out all the details, even where the snow is to be piled and distances to any cars present, liabilities and more. Proposed square footage price breaks might apply.